INCOMING! Two miniature dolphins have left their main pod and are charging towards our runabout like a pair of ocean-going puppies eager to play. Spotted through polarised sunglasses just below the surface of the water 20m to starboard, tails pumping, the dolphins are building momentum to surf the bow wave of Walkabout, an aluminium cruiser bashing its way around the Kimberley coast. In the near distance, another group of miniature spinner dolphins is on the run for food. Nine in formation, three abreast, breaking the surface in graceful unison. The Indian Ocean, sparkling in the midday sun, has turned to dolphin soup. Bow-riding dolphins are nothing new. The practice is a well documented cetacean pleasure, believed to have developed from surfing the pressure waves of migrating humpback whales. But this is no ordinary dolphin run. We are watching a group of dolphins that may be a new species. As with a vast majority of Australia’s aquatic life these miniature Kimberley dolphins have not been recorded in the scientific literature. For some, their discovery carries a deep warning about the potential hidden cost of rushing towards the future, losing or impacting on species that we never knew existed. 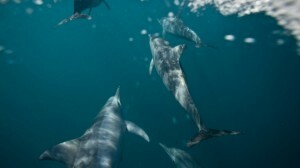 It also raises questions about whether an $80 million environmental survey should have identified and disclosed a dolphin that could well turn out to be unique. THE waters off the Kimberley region are brimming with sea life: dugongs, southern blue whales, whale sharks, black marlin and big schools of northern bluefin tuna, which sit at the apex of the aquatic food chain. With 11m tides, 6m-long saltwater crocodiles and periodic cyclones, the Kimberley coast is one of the world’s least explored and most hostile regions. Due to its extreme conditions, the coastline is home to a host of unique marine creatures – corals that challenge existing scientific beliefs about where it is possible for them to live, and the Australian snubfin dolphin, which in 2005 became the first new species of dolphin recorded anywhere in the world for 50 years. Last year, another new species, the burrunan dolphin, was identified in Melbourne’s Port Phillip Bay. The remoteness and rugged beauty of the Kimberley coast has underpinned a bitter campaign by conservation groups against Woodside’s planned construction of a $40 billion liquefied natural gas hub at James Price Point, 60km north of Broome. Woodside is proud of its environmental record. A spokesman says that, together with its Browse gas field joint-venture partners, the company has spent more than $80 million on environmental studies of the region since 1993, including studies of whales and other marine life. The company’s 2011 sustainable development report says it partnered with the WA Museum to research the marine biodiversity of northwest WA. Woodside says this research has identified 10,700 species and discovered 495 new species. The Browse basin and James Price Point research includes a marine megafauna report, released in December 2010, which led to a 440-page draft upstream environmental statement published in November 2011. Woodside CEO Peter Coleman described the document as one of the company’s “sustainable development highlights” for the year. For Murdoch University cetacean research fellow Simon Allen, $80 million is the sort of money that most scientific researchers can only dream about. There’s not much Allen doesn’t known about dolphins. He has spent years monitoring the mammals at Useless Loop, in the World Heritage-listed Shark Bay, with Michael Krutzen from the University of Zurich. It sits alongside the world-famous Monkey Mia dolphin centre, which this year celebrates 30 years of operation. He has a detailed understanding of the complex social structures that govern dolphin life: how female dolphins at Shark Bay have adopted the use of tools to help them forage, and how males display an extraordinary level of cooperation for access to females with which to mate. “It is certainly a step above the complexity of chimpanzee troupes, and one or two steps below human politics,” Allen says. The photograph was clearly not of a juvenile bottlenose dolphin, as the “whistleblower” had been led to believe. Allen was immediately interested as he’d already heard anecdotes from fishermen about the existence of a miniature dolphin off the Kimberley coast. Standing on Cable Beach in Broome, Allen still gets goosebumps when he recalls his first encounter with this species. It occurred in September last year, at the end of the tenth and final day of his own survey work off Broome and north towards James Price Point. On the trip, Allen and his team found four species of dolphin, plus the previously undocumented miniature dolphin. For Allen, the find poses some difficult questions about the quality and scientific worth of environmental impact statements in general. If his own 10-day survey could find a species not yet known to the region, how is it that a multi-million-dollar environmental impact assessment missed it? Woodside’s environmental submission is now being assessed by the state government before it is handed to federal environment minister Tony Burke for final approval. The report lists 27 cetacean species in the region, including spinner dolphins, but does not differentiate between species and sub-species. “The environmental survey included a large proportion of unidentified dolphin sightings and made assumptions about what they were,” Allen says. Dwarf spinner dolphins are found in the Gulf of Thailand and the Arafura and Timor Seas. Another group of small spinners is being monitored in shallow waters near the southern edge of the Great Barrier Reef. The miniature dolphins in Australia may be related to the dwarf spinner dolphin from the Gulf of Thailand, evolving from that group after migrating to the east and west coasts. Another possibility is they have evolved separately from the normal spinner dolphin. The Great Barrier Reef miniature dolphins look like a normal spinner dolphin squashed into a smaller body and living in shallow water. “These [WA miniature spinners] appear slightly different to the ones on the east coast,” Allen says. “We don’t have enough data from the Kimberley to say whether these are physically similar.” More work is required, including a study of the skull, teeth and vertebrae. But it is quite possible, says Allen, for all three dolphin groups to be different species or sub-species. To properly identify where the miniature dolphins fit, scientists need morphological and behavioural data to support genetic differences between species. It’s early May and we’re camped out on the Walkabout at mosquito-infested Barred Creek, north of Broome, on an expedition to locate and photograph the mysterious miniature dolphin. With us are Allen, and filmmaker, crocodile hunter and Walkabout skipper Mark Jones, who has spent many years working throughout the Kimberley alongside outback legend Malcolm Douglas, who died in 2010. Lachlan Douglas, Malcolm’s son, who is in the process of untangling his corporate life in Sydney to pay more attention to his father’s Broome property and legacy, also joins the expedition. Richard Bradley, who has spent more than a decade working as a deep sea diver for the oil and gas industry, makes low-level passes in his Cessna, providing air support for the oceanic hunt. The first day yields two pods of boat-shy humpback dolphins – in rarely seen amorous congress – but no miniature dolphins. On day two, the ocean is boiling with big schools of northern blue fin tuna feeding on baitfish which are being simultaneously dive-bombed by squadrons of booby birds from the nearby Lacepede Islands. With aerial support from Bradley, the Walkabout expedition makes first contact with the miniature spinner dolphins at 11.04am in 41.7m of water, 15 nautical miles due west of James Price Point. Over four days, we see at least four distinct groups in both deep and shallow waters. Using a biopsy gun – a modified rifle with an oversized barrel designed to fit special plastic darts – Allen takes biopsy samples by firing a floating dart below the fin as the dolphin surfaces. A cookie-cutter-like point takes a small piece of skin before bouncing off the dolphin and falling into the water for collection. (The procedure has Murdoch University Animal Ethics approval and was conducted under State and Commonwealth research permits.) Allen says the procedure causes an instantaneous startle response, but does not cause the animals any distress. Photographing the dolphins presents more of a challenge. In the open ocean, waiting for the dolphins to approach, photographer Vanessa Hunter and lookout Jones catch the attention of a 4m bull shark that circles towards them on the thermal currents from the deep. “Shark, get out!” shouts Jones, as the animal closes in from behind. A second attempt is aborted when five inquisitive bronze whaler sharks, each about 3.5m in length, begin to circle Walkabout. To obtain the underwater images, Douglas uses his outback ingenuity to rig up a cradle for the underwater camera housing using only a milk crate, a shovel and a length of rope. Adding to the challenge is the fact that the dolphins will only approach the boat when it is moving at more than four knots. THE discovery of new dolphin species – the snubfin, the burrunan and potentially a new kind of miniature spinner dolphin in northwestern WA – highlights the gap in knowledge about our marine creatures, and the truth is Australia rates poorly when it comes to the level of scientific understanding of the nation’s vast oceanic resources. An international report, Census of Marine Life, published in 2010, dramatically illustrates the point. The census was the culmination of a 10-year exploration involving 270 scientists from 80 nations to assess what, where and how much lives and hides in global oceans.Australian marine scientist Dr Ian Poiner played a lead role in coordinating the census, which will soon be expanded into a new 10-year study. The first census report found there were at least 750,000 undiscovered species in the oceans out of about one million-plus species. Australia ranked as one of the least properly explored, with about 250,000 or 80 per cent of species in its oceans not yet described by scientists. This compared to Europe, 10 per cent; South Africa, 38 per cent; Japan, 70 per cent; and Mediterranean deep-sea, 75 per cent. At the Rio+20 conference on sustainable development in June, Australia will make much of its commitment to the Bardi Jawi Rangers, an indigenous group which is seen as a model for generating employment opportunities on indigenous lands. The Bardi Jawi are traditional custodians of the breathtaking beautiful and treacherous Kimberley waters. They know how to harness the 11m-plus tides that create horizontal waterfalls as the water rushes from coral-covered plateaus, and how to navigate between islands through eddies that swirl in giant crocodile- and shark-infested waters. Sitting in their headquarters at One Arm Point, north of Broome, the rangers say two of their members were selected to take part in aerial surveillance to search for dugong in the waters off James Price Point. As part of the Woodside environmental assessment, they were flown to Broome and given full emergency procedure training in how to escape from a helicopter if it crashed into the water. But in the end they were only required as spotters for one day – out of season. The Bardi Jawi’s radio tracking research follows a female dugong making its annual migration south to spend a lengthy period foraging in the shallows at James Price Point. Woodside’s environmental report confirms that dugongs have been identified near James Price Point in aerial and satellite tracking surveys. But it says “the area has not been identified to have any particular significance for the distribution of dugongs along the Dampier Peninsula” – something the traditional sea rangers find difficult to comprehend. If nothing else, Allen argues, by not using peer-reviewed science, the tens of millions of dollars spent by companies such as Woodside on environmental impact surveys represents a missed opportunity in the quest to gain further understanding of marine science in one of the world’s last frontiers. This entry was written by Meredith, posted on June 2, 2012 at 9:38 pm, filed under Environment, Environmental impacts, News Archive, Woodside. Bookmark the permalink. Follow any comments here with the RSS feed for this post. Post a comment or leave a trackback: Trackback URL. Australian’s put apathy behind, show our government just how much we care for our ecosystems, our children’s future and the animals/mammals/wildlife that inhabit our unique continent and connecting oceans. Australia is gifted with mineral resources, environmental resources and people resources. We r a young country and we can make a major difference. Blessed be more discoveries that point out just how important allowing our Kimberleys to just be is …..